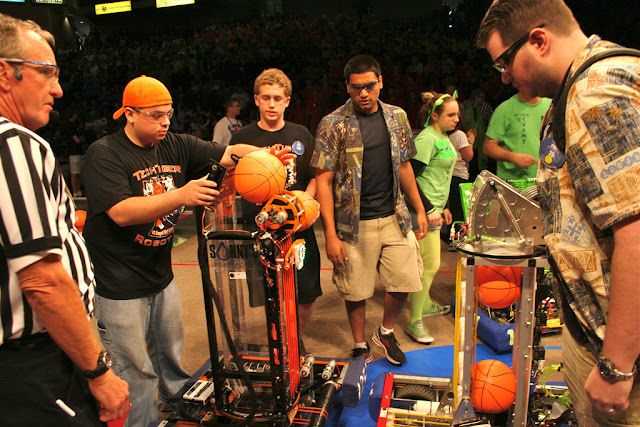 The Florida regional engagement of the FIRST Robotics competition took control of the UCF Arena on March 10. Seemingly inspired by NBA All-Stars, the robots came out to shoot basketballs for points in this year’s ever evolving game. Robotic teams from around the nation and world have only had a few months to design and build their robots using the given parameters. Teams are based around high school students interested in science and engineering, led by mentors and technological advisers. Teams are also supported by a number of sponsors to help cover the high cost of building the robots and entrance fees into the regional competition. This year’s game, entitled “Rebound Rumble,” raises the challenge of scoring points by remotely shooting small basketballs into one of several hoops. 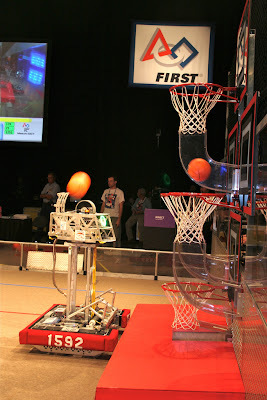 Rounds start with a brief fully automated segment for per-positioned, fully loaded, and properly calibrated ‘bots,’ to attempt the equivalent of a free throw before the real action begins. Once the automated time is up, teams are allowed to remote control their creations in order to scoop up small basketballs and shoot them into several baskets on their side of the playing field. 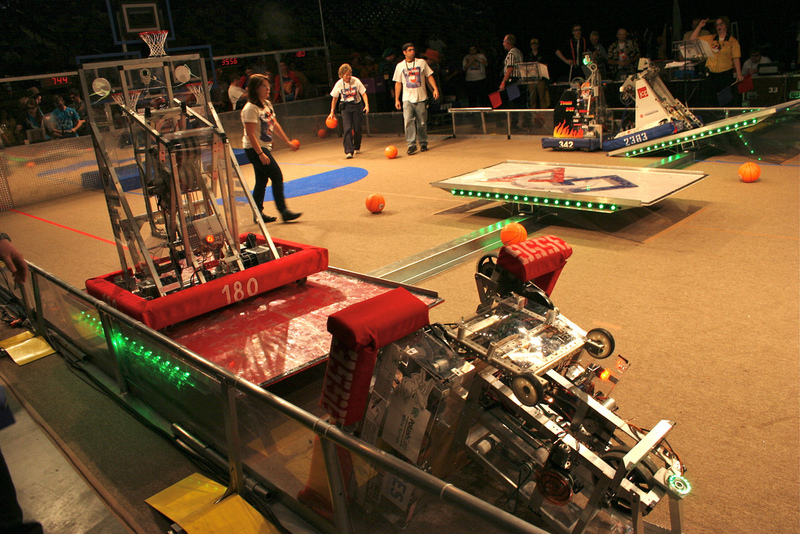 Changes in height and sizes vary the points earned by scoring goals, and more advanced robots piloted by skilled operators were able to make several successful points during each round. This challenge in scoring points is far different from the theme of last year’s game involving placing small inflatable rings onto raised hangers. Teams have to find a proper calibration and positioning to aim and fire projectiles at rapid succession. The end of each round has an optional bridge battle for earning extra points for the final team score. Robots fight for position on shifting platforms and have to work strategically to ensure if going for the bridge or scoring more points is worth the time allowed. As is customary, alliances are formed between teams of three robotic groups as they battle into later eliminating rounds of the competition. Through a long elimination process, teams have several chances to reach the final rounds, and everyone is ensured a fair opportunity to try and finish in top positions. It’s only after this complex robot bracketing that the final trophies are awarded and everyone rolls up their power cords to head home. This event also ends with a diverse award ceremony to encourage teamwork and creativity for robotic teams that don’t place in the top spots, and go on to the district competitions and final championship. Awarding those that don’t necessarily win helps to encourage a continued love for science and interest in technology. F.I.R.S.T (For Inspiration and Recognition of Science and Technology), is meant to inspire the youth for what the field of science and technology has to offer for future employment. Scholarship opportunities are another strong element of FIRST with 925 scholarships offering more than $14.7 million in aid this year. There are also additional benefits for college students that are returning members in the program that help as mentors for the new members to the robotic teams. Major corporations like Lockheed Martin, Walt Disney, and NASA help sponsor and look for potential employees throughout the entire program. The FIRST competition receives a lot of attention in Florida because the competition started in the Kennedy Space Center in 1992. NASA, the head supporter of this competition, has strong local ties to the Central Florida area. And with the future of space exploration focused more on semi-autonomous, unmanned exploration robots, groups working in this field have a real applicable use for this type of innovation. But the message is not solely focused on robotics, and many of those involved are just generally enthused about the future innovations of technology and science. Team 'Bionic Tigers' scoring several points during the game. High Tension bridge battles are a big point, ending each round of this wild robotic game.